Eleven people have died in Cuba after drinking illegal alcohol, the public heath ministry has said. At least 40 others have been admitted to hospital in the capital, Havana, and several remain in a serious condition. The toxic liquid was stolen from a government department and sold as traditional Cuban rum, according to reports read on state television. The victims suffered symptoms of poisoning by methanol, which is commonly used as a solvent or fuel. The first cases were seen on Monday, and by Wednesday seven fatalities were reported. Illegal methyl alcohol, also known as wood alcohol, is highly toxic and can lead to nausea, headaches and blindness. The authorities called on anyone suffering symptoms to come forward for urgent medical treatment. 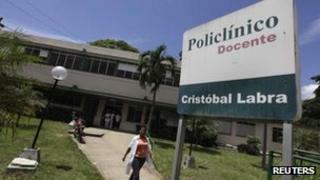 Two employees from the Cuban Institute of Pharmacy and Food are being investigated, state TV said. The 11 people who have died were aged between 37 and 58 and lived in the La Lisa district of Havana.